HIPAA authorization, emergency contact information, physician information and allergies and medical conditions. Complete an enrollment form and submit it via fax, mail or email to Legal Directives along with a copy of your healthcare directives and your emergency and physician information. Our team will create an account for you and upload your directives and information into your secure online account. Once enrolled, we will mail you a wallet card containing instructions for retrieving your healthcare directives, emergency contacts and physician information. Included with the wallet card are stickers to place on your drivers license alerting emergency responders that your Legal Directives wallet card contains instructions. 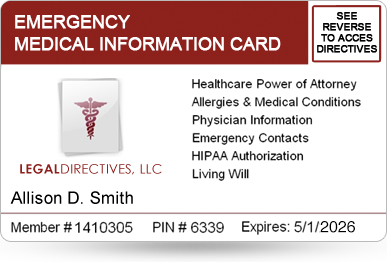 The Legal Directives wallet card gives emergency responders and hospitals two ways to access your important healthcare directives and emergency contacts. They may use our automated phone system or login through an online portal. Either way, Legal Directives provides the directives needed in the case of an emergency. "One thing that has always concerned me while traveling is 'How will my healthcare directives be found if I have a medical emergency while traveling?' Legal Directives solves this problem." "This service gives me great peace of mind. Legal Directives helps protect me in the case of a medical emergency by making my healthcare directives and emergency contact information available." "As a college student, the Legal Directives Emergency Wallet Card makes both me and my family feel more secure."